Well, if you’re going to make a movie about an invisible man, you’d better hire an actor with a captivating voice. 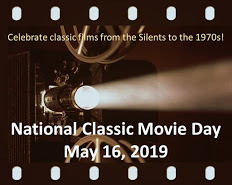 Universal Studios made the right choice in 1933 when they (reluctantly) hired a British actor named Claude Rains for the title role in the sci-fi horror film, The Invisible Man. The film, based on the H.G. Wells novel, explores the deteriorating mental condition of a man who makes an astonishing scientific discovery: How to Become Invisible. It takes place in a small English village, where Rains arrives in the first few minutes of the film. He’s a solitary traveller, sporting a thick coat, mummy-style bandages and dark sunglasses, to conceal his Plight. He rents lodgings at the local pub, owned and operated by Una O’Connor and her husband (Forrester Harvey). At first, O’Connor takes pity on Rains – she thinks his bandages are the result of a horrible accident – and kindly overlooks his rudeness and violent temper. But Rains is a lousy tenant. He’s turned her room into a mini-laboratory, and he spills chemicals on her carpets. Not only that, he’s two weeks behind in his rent. O’Connor persuades Harvey to evict Rains. Rains responds by pushing the man down the stairs. Things only get worse from here. Rains’ invisible man is a violent, unpredictable character. The longer he remains invisible, the more unstable he becomes. We never know what will Set Him Off. Claude Rains, the actor, is truly remarkable. He’s created a complex, faceless character using only his well-modulated baritone voice. There’s never any confusion about what his character is thinking. For example, when he first appears in the village, he’s pushy and abrupt, but his words are also tinged with sadness. Later, when he visits his friend and colleague (William Harrigan), he’s cordial. “How are you, my friend?” he asks, and means it. He details his Invisibility Findings to Harrigan – scientist to scientist – such as his eating habits and his (supposedly) increased intelligence. Yet. When he starts to doubt Harrigan’s loyalty, his voice adopts a taunting menace. This makes us nervous. We see a glimpse of his old personality when he reunites with his girlfriend (Gloria Stuart). His tone is affectionate, he calls her “darling”, he teases her about her “funny little hat”. 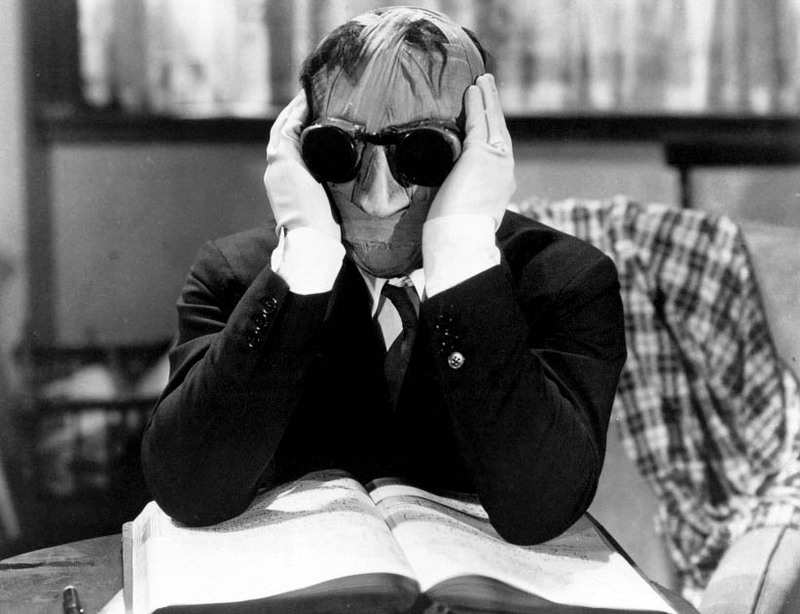 Claude Rains was 44 years old when he made The Invisible Man. He had already enjoyed success on the London Stage and as an acting teacher at the Royal Academy of Dramatic Art. (Get this: Two of his students were John Gielgud and Laurence Olivier.) He was offered a screen test at Universal Studios in 1932, when he was working for the Theatre Guild in New York. It’s hard to imagine anyone else in this role. His talent is equal to the extraordinary special effects, which are still impressive today. If you’ve not seen Claude Rains in The Invisible Man, there’s no judgment here. You know what to do. To learn more about John P. Fulton’s special effects in this film, click HERE. 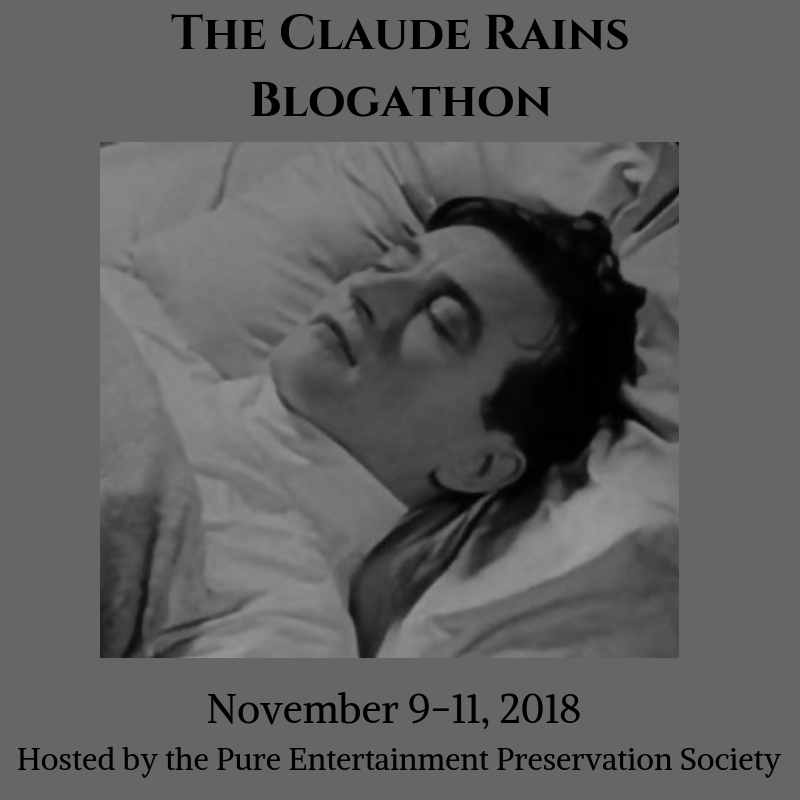 This post is part of the CLAUDE RAINS BLOGATHON hosted by the Pure Entertainment Preservation Society. 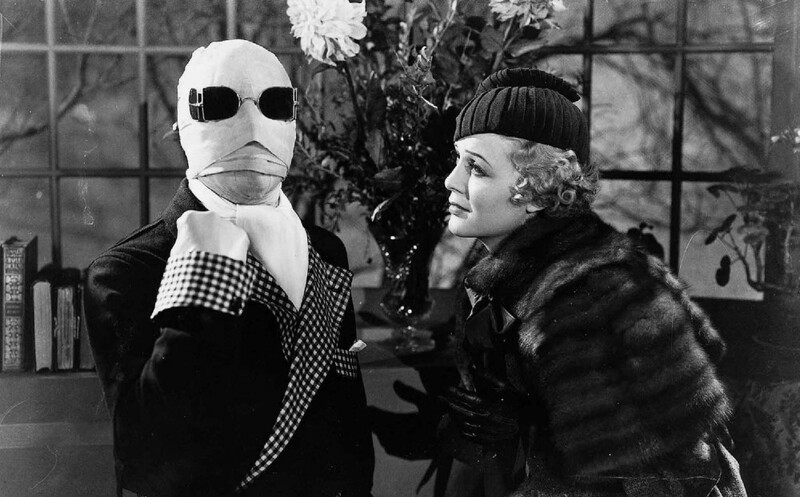 The Invisible Man: starring Claude Rains, Gloria Stuart, William Harrigan. Directed by James Whale. Written by R.C. Sherriff. Universal Pictures, 1933, B&W, 71 mins. I hope you are able to see this again. It never gets old – mostly thanks to Claude Rains’ performance. Indeed Rains owns this role and the movie. He is captivating and unforgettable, and you aptly impressed us with that in your piece. “Captivating and unforgettable” is a perfect description. Claude Rains is that, in almost every movie. I often wished the US president was invisible but after reading this, I guess not. Q: What would be The Invisible Man’s primary platform in his presidential run? A: Greater transparency in government. Due to illness and a few other things, I’ve been something of an invisible man myself lately in the blogging world, but I’m now back to semi-normal and looking forward to following your posts again. As for Claude Rains and The Invisible Man, I saw this years ago and think your review is spot on. Good show! Welcome back to the blogosphere! Glad to hear you’re on the mend. I’ll be paying your site a visit next week. Claude Rains truly is remarkable playing one of the finest ‘monsters’ in all of cinema. His monologue about his planned reign of terror is so damn chilling, yet utterly awesome. Exactly! His calm description of a “reign of terror” sends a chill down my spine. I’ve seen this one and have to agree about Claude Rains. He did so much with his voice in this role. This is a fine, informative article. You gave a good overview of the film and Claude Rains’s performance in it, as well as some interesting background information about him. I have also read about his early life and his career on the stage. He must have been a very good teacher, since he taught “the Great” Laurence Olivier! Thank you for participating in my blogathon and advertising it on your website. I truly appreciate your support, and I will add you to the roster right away. Hi Rebekah! Thanks for your kind words, and also for hosting this fab tribute to Claude Rains. He deserves more fan love these days. I watched part of this the other day, but I don’t remember where or why I stopped. Ack – I hate it when Real Life interferes with my movie watching. I know! It’s like they expect me to work and parent and cook and blog instead of watching movies and knitting. Apparently a sequel was made seven years later in 1940 called THE INVISIBLE MAN RETURNS with Vincent Price in the lead role. As far as voices go Vincent Price was certainly up there in the creepy stakes. Thanks for the link! I’m looking forward to seeing Vincent P in this role. You are so right…Rains is remarkable in this film. I also think it may be James Whale’s best film (sorry BRIDE OF F) and Universal’s finest in a long line of quality horror pictures. I agree. This is one of Universal’s best in the series. I’m still so impressed by the clever special effects. Possibly the greatest vocal and body language performance ever put on film. We never see Claude’s face until the end, but he holds our attention, dominates every scene he is in, and conveys the growing insanity of his character so convincingly through his voice and body language. Such a good film. It is one of my favourites from the Universal Monster Movies. So true! Claude Rains OWNS this film. This is real talent at work. And THAT is defining praise from Maddy. I love this film. Did my own review of it last month in a double bill with The Wolfman (1941). What a great, complex performance by Claude Rains. Yet another film to add to my TBW list. Thank you! I (obviously) haven’t seen this so can’t say but totally know what you mean about not being able to imagine anyone else in a role. I love learning behind-the-scenes snippets like this. Sounds like Rains nailed it. Well done review that gets across how special this movie and performance are. I feel like this one is a bit of a stepchild next to Dracula and the two Whale Frankensteins, but it deserves more attention and respect (and love, of course! )—while it was the voice that made Rains’ first starring appearance a starmaker, what he endured physically to be “invisible,” being covered in black velvet beneath the costumes so he could be “disappeared” from the matching film, is its own little horror story. Given how hot it was under the lights just in normal costume, the thought of being covered head to toe in black velvet is pretty alarming! But total pro that he was, Rains did it. And like Karloff did with Frankenstein’s monster, Rains brought such artistry and dimension to Jack. Anyway, terrific review, and thanks for reminding me that it’s time to watch this one again! 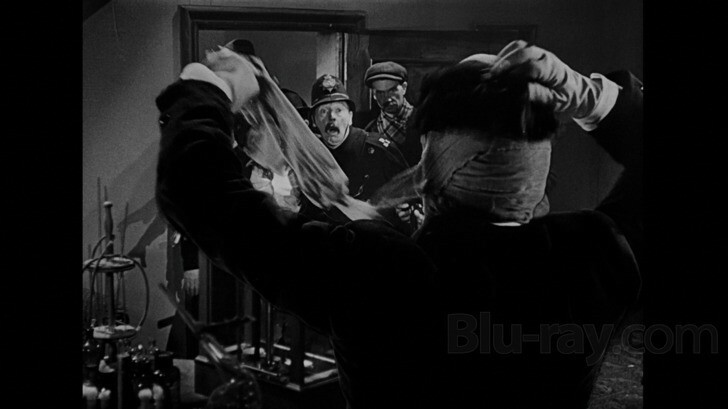 You’re right – the rigamarole Claude Rains had to endure for the sake of special effects. He said later he wasn’t very gracious about it, but who would be? I love Claude Rains’s voice in anything, too! He is the perfect Invisible Man. Nice article. Raines really does have a mesmerizing voice :-). Also, although he played other evil roles in his career, the way he conveys the evilness of this character without the benefit of the kind of facial expression and body language that other actors would have access to is pretty amazing. You said it! To convey such a character without relying on facial expressions and other body language is incredible. Enjoyed reading your review. The special effects in The Invisible Man are amazing for 1933 though you are right Claude Rains adds a lot to the performance. The freedom of doing what you want when you’re invisible is mind-blowing, but also a lonely place to be because other people are scared of your appearance. The story is simplified by having him insane. To me, would have been more interesting if he was sane. You make a good point re: what an Invisible Man would be like if he were sane. That would be a really interesting film.